Since 1950, the Association of the United States Army has worked to support all aspects of national security while advancing the interests of America’s Army and the men and women who serve. 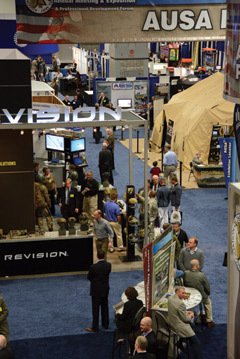 This year the conference will be held 13 – 15 October at the Walter E. Washington Convention Center in Washington, D.C.
Back in February, AUSA held its 2014 AUSA Winter Symposium and Exposition, in Huntsville, Alabama. The event was a huge success. The attendance in Alabama was more than four times the number than last year’s event which was held in Fort Lauderdale, Florida. AUSA officials said they believed that moving the show closer to a major military installation would encourage participation. They seemed to be right. Not only did the number of attendees grow, the volume of participation from those at the meeting also increased.